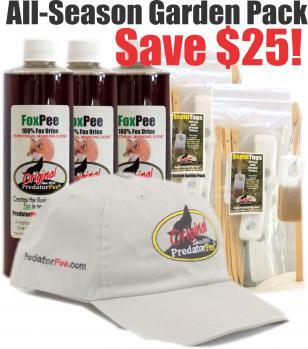 Fox Pee All Season ScentTag Garden Pack - Save $25! When rabbits and skunks are ruining your garden, you need our Fox Pee All Season ScentTag Garden Pack. The fox pee Garden Pack gives 5 months of protection against rabbits and skunks. This skunk and rabbit garden repellent contains three 12-oz. bottles of fox pee, two 10 packs of ScentTags, and a free PredatorPee® hat! Plus, you save $25 over products purchased individually.